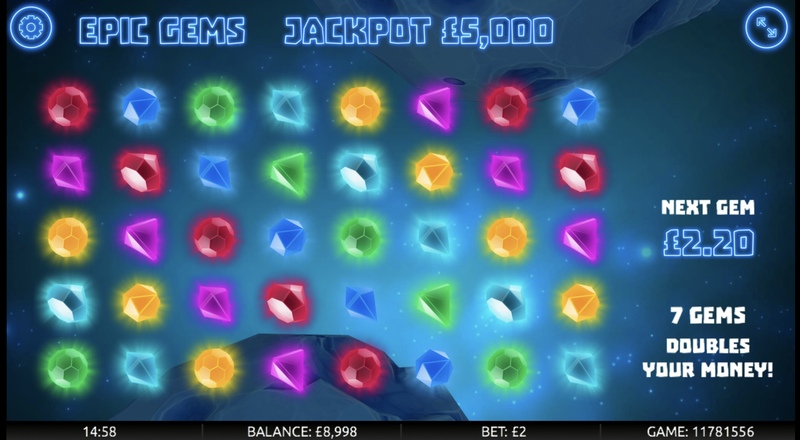 Epic Gems is an electric charged online slots game filled with high-octane paylines and beautiful graphic gemstones. Listen to the eerie science fiction soundtrack and watch in awe following every spin as the gems spin into a swirling vortex before matching to deliver your sumptuous cash rewards, multipliers and casino free spin bonuses. Gamevy is an award winning, licensed supplier and operator of a high quality selection of real-money slot games. They believe in combining skill, chance and life-changing jackpots for ultimate fun. Gamevy specifically design their games to appeal to a wide demographic of players, including bingo, lottery and slots games. Epic Gems is a slot online games made by Gamevy. It is an intense and exciting game that is loosely similar to minesweeper. Epic Gems has a much more appealing graphical interface than minesweeper, and a UI that is much more simple and easy to understand. The game involves taking risks, as your stake can be lost if you run into any mines. But if you enjoy being brave and are up for a challenge, this is the game for you. The current wager will be shown at the top of the games UI. The lowest wager the player can begin with is 1.00 which will give the player the possibility to win a 2,500 coin jackpot. The cash reward is relative to the player's wager, meaning the jackpot rises higher each time you increase your bet. The largest jackpot available is a satisfying sum of 25,000 coins. At the start of the game the rules will appear on the screen, as well as an up and down arrow with the monetary figure between them. This is the wager. Once you have chosen the amount you wish to wager, simply click the bet amount and your game will begin. Learn more about how to pay by phone slots! At the beginning of the game you will see 40 jewels on a square board. 4 of these jewels will be fake and 7 of them will double your money. Be cautious because if you tap in the wrong place your gems can be exploded by bombs. When the player wants to select a gemstone, they simply need to click it and it will go into to a vortex and be added to their total winning amount. You can either click them one at a time or swipe across the whole line depending on how much of a risk you are willing to take. There is a luminous market above the maelstrom indicating how much your next gem will be worth and underneath that your payout total is shown. If at any point you want to cash your winnings, you can do so at any time by clicking the “payout” button. This will end the game and pay out your total winnings, ensuring that your money is safe. Epic Gems is a great game and a unique take on a familiar concept. Although the game may sound risky, its unpredictability is one of the most appealing factors for the players. 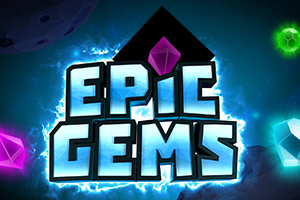 There's a reason it's called epic gems, and if your enjoy gripping and intense games and are tired of always playing it safe then I most certainly recommend this game. I wouldn't recommend this game for the light of heart or beginners, though. Play today our popular Easy slot games or visit easyslots.com for more information!